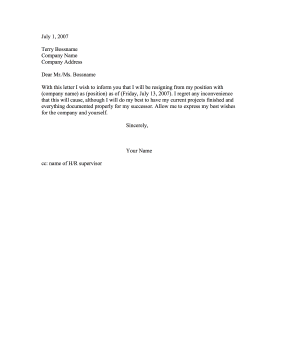 Using formal and professional language, this printable resignation outlines the details of an employee's departure. With this letter I wish to inform you that I will be resigning from my position with (company name) as (position) as of (Friday, July 13, 2007). I regret any inconvenience that this will cause, although I will do my best to have my current projects finished and everything documented properly for my successor. Allow me to express my best wishes for the company and yourself.